Laverne's Story . 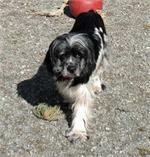 . .
Update 03/03/2013: "If you are looking for a dog that will adore your every move, Laverne is the one for you!" Laverne recently moved to another foster home for closer evaluation. 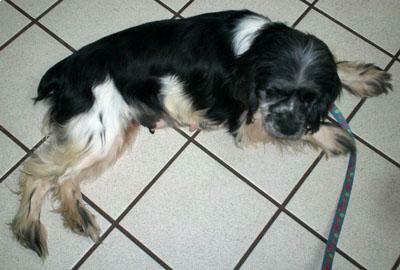 She and Shirley are now in separate foster homes and are doing fantastic. Laverne’s new foster mom proclaims this little girl to be so sweet and cuddly! A short time in MAESSR’s care and a good diet has helped Laverne put on a couple of needed pounds; she is really looking great! Not allowing her impaired eyesight to slow her down, Laverne enjoys a good run in the back yard with all of the other dogs in her foster home; but she is usually found right at her foster mom's feet. She definitely loves her people. If you are looking for a dog that will adore your every move, Laverne is the one for you! Update 01/09/2013: "Laverne was seen by a veterinary ophthalmologist this past week to see if she would be a candidate for cataract removal surgery." Laverne was seen by a veterinary ophthalmologist this past week to see if she would be a candidate for cataract removal surgery. There was both a positive and a negative outcome of this consultation. The negative is that Laverne's left eye has retinal detachment. This means that eye is not operable and she will remain blind in that eye. The positive is that Laverne does have sight in her right eye and it will not get any worse than it is currently. A lesson was learned while at the ophthalmologist: Laverne's right eye had actually aspirated and absorbed the cataract itself, thus restoring her sight in this eye. This was a very informative visit! With the consultation now complete, Laverne is ready for her forever home. This little girl has an amazingly sweet personality and, although she may be pint-sized in body, her spirit and personality are anything but pint-sized! No matter how many you have in your pack, surely there's room for a tiny cuddle bug like Laverne! Original: "This was probably this little girl's first bath in a very long time since it took three washings at the self-serve bath center to get the dirt off of her." When their owner no longer found them useful for breeding, cocker spaniels Laverne and Shirley found themselves dumped in a small rural Pennsylvania shelter. Shelter staff members reached out to both cocker spaniel and blind dog rescues via Facebook when a MAESSR volunteer living in the area saw the posting. When the other rescues could not help due to either lack of funds for vetting or a shortage of foster home, the MAESSR volunteer suggested reaching out to MAESSR's president who has a soft spot for cocker spaniels and dogs with handicaps. Sure enough, Laverne and Shirley became "honorary" Springers! Upon becoming a MAESSR girl, the first order of business for Laverne was to get cleaned up. This was probably this little girl's first bath in a very long time since it took three washings at the self-serve bath center to get the dirt off of her. Through the two hours in the bathtub, Laverne let her foster mom do whatever she needed to do to her; the warm water no doubt felt good to her. Although a bit frightened of the hairdryer, Laverne had no problems with having her nails clipped. When this spa treatment was over, a very pretty cocker emerged! Laverne is bonded closely with her friend Shirley and does not leave her side. Laverne is completely housetrained and has very good house manners. Being just a tiny little girl, Laverne can't get into too much trouble. A little more shy than her friend, Laverne takes a bit more time to warm up to people, but once she does, she is just a little love bug. For safety reasons, Laverne is crated with her friend Shirley when their foster mom is not home and they do not mind at all. Little Laverne is also a good passenger on car rides. After a few days in foster care, Laverne went to the vet for a complete and thorough exam. Eyes were checked, blood-work done, and a microchip was implanted. While she was a little nervous, Laverne handled it all very well. 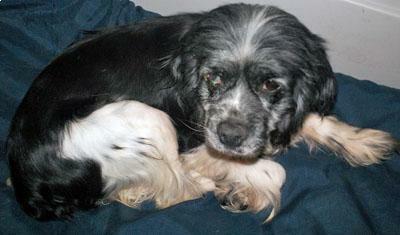 The vet found her to be blind in one eye due to a cataract. This will be further evaluated to see is she is a candidate for cataract removal. Her other eye is not affected and she can see out of it. Laverne's teeth are also worn down to little nubs on the top, most likely from chewing on a crate. This does not seem to bother her, but she is given a little wet food along with her kibble to make sure she gets enough to eat. Since the resident dogs are all so much bigger than she is, Laverne tends to ignore them; she is just not quite sure of them. The resident cats, on the other hand, are just Laverne's size and she likes to chase them to get them to play. The cats are not too wild about this sort of play. Watch for more on Laverne in the weeks to come!